Konami’s Dance Dance Revolution (DDR) admittedly seemed to be showing its age the last year or two. The last version of Dance Dance Revolution for the Wii to show any kind of real innovation was Hottest Party 2, which was released in 2008. Hottest Party 3 was released in 2009, but didn’t add much new to the series except a few poorly-conceived attempts to try to incorporate the Wii nunchuk and the Balance Board. At the end of the day these attempts just detracted from what made DDR great to begin with. In 2010, they released Hottest Party 4 in Europe. 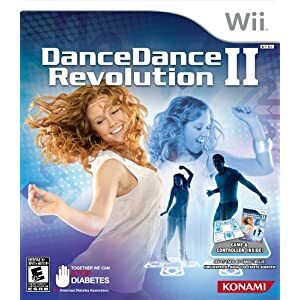 Perhaps taking a cue from successful movie “reboots” such as Star Trek and Batman, Konami decided to name the same game “Dance Dance Revolution” in the United States. But sadly, it was pretty much the same game as before. Many who ended up paying upwards of $70 for it were asking themselves why they wasted money for essentially the same game they could have bought in 2008. In 2011, Dance Dance Revolution II (still being called Hottest Party 5 in Europe) is here. And the burning question is, does this new version bring anything new to the table? Or is it yet another repackaged version that will cause more buyer’s remorse? For the few out there who don’t know, DDR requires the use of a 3′ x 3′ plastic “dance mat” you put on the floor with four directional arrows that you step on. As music plays, a combination of arrows will scroll on the screen to the beat, and your goal is to step on the arrows precisely. Sounds simple, but when the arrows are coming at you at breakneck speed, and things like eighth-notes, “hold” notes (where you keep your feet pressed down) and simultaneous arrows (requiring you to jump) are added, you’ll be moving your feet faster than Fred Astaire. The first thing to get out of the way is any comparison to games like Just Dance 3 for the Wii, Dance Central 2 for the Xbox, and Everybody Dance for the PS3. Those are dancing games where you learn “real” dance moves. DDR is and always has been a “pattern-matching game more” than a “dance game”. You won’t “wow” anyone at weddings and bar mitzvahs with moves you learn on the DDR dance pad (and sadly, I’ve tried). What DDR does have, and probably always will, over those other “dance games” is the best precision, not surprising as it has only four steps to detect as opposed to an infinite number of motions. So whether your score is high or low, you know you’ve earned it legitimately! The opening menu of Dance Dance Revolution II is blissfully simple. There are four choices: Dance Mode, Workout Mode, Training Mode, and DDR School. Dance Mode is where you can jump into playing. You start out by selecting the number of players, from 1 to 4. You’ll need a dance mat for each player and a Wii remote for each to control menu choices. There are two modes of play when playing solo. The first is “Normal” mode, which is the DDR we all know and love, where you dance to progressive sets of challenges to rack up DDR points and unlock new songs and features. The second is new to the Wii called “Double” mode, where if you have two Dance Mats, you can dance using EIGHT arrows instead of four, jumping from mat to mat to try to achieve a high score. This is a feature that’s been available on the arcade version of DDR which has finally made it to the Wii version, and definitely is an innovation which really extends enjoyment (and workout potential) of the game. Here’s me attempting to playing Justin Bieber’s “Baby ft. Ludacris” using Double mode. I did okay, right? So feeling my oats a little bit, I decided to try “Spice Up Your Life” at Difficult mode. Needless to say, I was jumping and flipping around and could only muster a “D”. This is definitely something which, as you try to master it, you’ll find yourself getting into great shape! There are three modes of play for playing with 2 or more players. “Normal” style lets users compete head-to-head. “Friendship” style will award all players with the highest score that any player achieved. “Sync” style is the opposite: if any player gets a “MISS” or “NOT QUITE”, the entire game fails. Next, you’ll select your song and the difficulty level (Beginner, Basic, Difficult, or Expert) that you want to attempt. If you’re playing multiplayer, each player can choose their own difficulty, so stronger players can compete against weaker players on the same song, each playing at the level they’re most comfortable with. Something else that’s been carried over from the arcade version is the “Groove Radar”. Each song has a somewhat complex graph that rates each song/difficulty on five attributes: Stream (the overall density of steps in the whole song), Chaos (how irregular the steps are), Freeze (the number of “freeze” steps where you hold on a particular arrow), Air (the number of jump steps in the song), and Voltage (the highest density of arrows that appear at once in the song). At the end of your performance, you’re given a score based on these attributes. Since this wasn’t a big hit with the arcade version, I’m not sure why they’ve ported it over to the Wii version. In any case, if you’re someone who really wants to evaluate your DDR performance, this lets you do it with unprecented precision. If you’re not, it’s something that you can easily ignore. In addition, there are 64 other songs which consist of new original songs from Konami and songs from previous releases of DDR on other platforms and arcade machines. These are mostly in the frenetic, rapid-beat, Japanese pop music-style that DDR is known for. Something else new to this version of DDR is the ability to choose either the short version of a song (1-3 minutes) or the long version (3-5 minutes). There are also improvements with gameplay itself. Getting from the menu to the song takes only a few seconds, where in previous version there’d be a painfully long wait. The voice of the annoying commentator with the fake British accent (“it’s 100% AWESOME!”, “relax and FEEL THE BEAT”) is now relegated to the speaker in the Wii remote, while the TV speakers play just the song (you can also turn the voice off completely under Options). As with previous versions, for most licensed songs you can view the music video in the background; for other songs you see animated dancers. Thankfully, they’ve completely done away with gimmicks such as hand movements and Balance Board compatibility. This is DDR back to its basics–step on the arrows correctly to get a high score. And it does this as well as it ever did. With “Workout Mode”, you start out by typing in your height and weight. From there it’ll calculate your ideal weight and BMI (discreetly hidden from view until you click the “-” button on your Wii remote). You can then select a workout target by Play Time (for example, if you want to do 30 minutes of cardio a day) or by Calories burned (for example, if you want to burn 30 calories a workout). By the way, DDR will use the scientifically-accurate term “Kcals”, but that’s the same as what you and I call “calories” (which the average adult takes in 2000 a day of). You can also choose no goal, in which case you’ll work out to your own preference and still be able to track calories and time spent. To make your workout simpler you can turn CUT on (which ensures there are no notes less than a quarter note) and turn JUMP off (which will turn off simultaneous step arrows). But I find leaving both on make the workout a lot more fun and strenuous. You then go to song selection, where you have the same options as in Dance Mode. Happily, even in workout mode you can still clear “Challenge Tasks” and earn DDR points. And of course, you’ll see exactly how many calories you burned for the last dance and how many you’ve burned cumulatively. You can also keep a record over time of all the calories you’ve burned. Here’s a workout where I set a target of 70 calories, which had me playing Rihanna’s “Only Girl (In the World)”, Miley Cyrus’s “Can’t Be Tamed”, and Willow Smith’s “Whip My Hair” before I reached the goal. Needless to say, I was quite out of breath. If you had to choose between typical step aerobics and DDR, the choice is clear–DDR is more fun, much better exercise, and much better motivation. “Training Mode” lets you choose any unlocked song at any level and practice any section of it, either in Normal or Double mode. This is extremely useful at advanced levels where there’s a section of a song you just can’t master. “DDR School” is for complete newbies who need to be taught how to play from the beginning. The verdict? I’ve admittedly been bearish on Konami the last two years, disappointed that the last two versions of DDR really did nothing to push the platform forward. But this time they’ve gone “back to basics” by getting rid of a lot of those gimmicks and focusing on what works. I won’t say it’s a perfect game yet. I was a bit surprised at the lack of a DLC option, meaning that to get new songs we’ll probably be forced to purchase future versions. And the dance mat is still flimsy and its lack of padding is horrific for those who play on upper levels of houses or apartments. But even so, the addition of Double mode, the improved Workout mode, and the large selection of new songs tells me that Konami is really trying again and not just resting on its laurels. Hopefully with future editions they’re continue to not just phone it in, but reinvent it in new ways that’ll continue to keep it relevant amid the competition (I know this is just a dream, but some day I’d love to see a game that teaches dance steps like the tango, foxtrot, salsa, and waltz…but I guess that would require a pretty big dance mat). Now, just for Nutwiisystem readers, here’s an “insider tip”. I definitely recommend you purchase a second DDR mat, especially given the new Double mode. And unfortunately, mats from the Namco Active Life series will not work properly. You can go to Amazon and try to buy an official Konami Dance Dance Revolution Dance Pad Controller for Wii . It retails for $29.99, and in some cases I’ve seen sellers selling it for upwards of $50.00. But my recommendation is to go to an older, less successful Konami game that bunded the dance mat like Ultimate Party Challenge with Dance Pad Bundle and look at the sellers there (I do recommend double-checking with the vendor first to make sure the mat is included). Chance are you’ll snag a dance pad for less than the $29.99 retail price, and get a bonus game to boot. Thanks for the review. I have Hottest Party 1 and 2 and want to get a new game. I wasn’t sure which one to choose. I have been playing the first two mostly with the gimmicks turned off. So i am going to skip 3 and 4 and just get 5. Thanks for making the decision easy. I love your site.